What Are GMOs and How Are They Made? GMO is short for "genetically modified organism." Genetic modification has been around for decades and is the most effective and rapid way to create a plant or animal with a specific trait or characteristic. It enables precise, specific changes to the DNA sequence. Because DNA essentially comprises the blueprint for the whole organism, changes to the DNA change what an organism is and what it can do. The techniques for manipulating DNA were only developed in the last 40 years. How do you genetically modify an organism? Actually, this is a pretty broad question. An organism can be a plant, animal, fungus, or bacteria and all of these can be, and have been, genetically engineered for almost 40 years. The first genetically engineered organisms were bacteria in the early 1970s. Since then, genetically modified bacteria have become the workhorse of hundreds of thousands of labs doing genetic modifications on both plants and animals. Most of the basic gene shuffling and modifications are designed and prepared using bacteria, mainly some variation of E. coli, then transferred to target organisms. The general approach for genetically altering plants, animals, or microbes is conceptually pretty similar. However, there are some differences in the specific techniques due to general differences between plant and animal cells. For example, plant cells have cell walls and animal cells do not. Genetically modified animals are primarily for research purposes only, where they are used often as model biological systems for drug development. There have been some genetically modified animals developed for other commercial purposes, such as fluorescent fish as pets, and genetically modified mosquitoes to help control disease-carrying mosquitoes. However, these are relatively limited application outside of basic biological research. So far, no genetically modified animals have been approved as a food source. Soon, though, that may change with the AquaAdvantage Salmon that is making its way through the approval process. With plants, however, the situation is different. While a lot of plants are modified for research, the objective of most crop genetic modification is to make a plant strain that is commercially or socially beneficial. For example, yields can be increased if plants are engineered with improved resistance to a disease-causing pest like the Rainbow Papaya, or the ability to grow in an inhospitable, perhaps colder region. Fruit that stays ripe longer, such as Endless Summer Tomatoes, provides more time for shelf time after harvest for use. Also, traits that enhance the nutritional value, such as Golden Rice designed to be rich in vitamin A, or utility of the fruit, such as non-browning Arctic Apples have also been made. Essentially, any trait that can be made manifest with the addition or inhibition of a specific gene, can be introduced. Traits that require multiple genes could also be managed, but this requires a more complicated process that has not yet been achieved with commercial crops. Before explaining how new genes are put into organisms, it is important to understand what a gene is. As many probably know, genes are made of DNA, which is partly composed of four bases commonly noted as simply A, T, C, G. The linear order of these bases in a row down a DNA strand of a gene can be thought as a code for a specific protein, just as letters in a line of text code for a sentence. Proteins are large biological molecules made of amino acids linked together in various combinations. When the right combination of amino acids is linked together, the amino acid chain folds together into a protein with a specific shape and the right chemical features together to enable it to perform a particular function or reaction. Living things are made up largely of proteins. Some proteins are enzymes that catalyze chemical reactions; others transport material into the cells and some act as switches activating or deactivating other proteins or protein cascades. So, when a new gene is introduced, it gives the cell the code sequence to enable it to make a new the protein. How Do Cells Organize their Genes? In plants and animal cells, almost all of the DNA is ordered in several long strands wound up into chromosomes. The genes are actually just small sections of the long sequence of DNA making up a chromosome. Every time a cell replicates, all the chromosomes are replicated first. This is the central set of instructions for the cell, and each progeny cell gets a copy. So, to introduce a new gene that enables the cell to make a new protein that confers a particular trait, one simply needs to insert a bit of DNA into one of the long chromosome strands. Once inserted, the DNA will be passed to any daughter cells when they cell replicate just like all the other genes. In fact, certain types of DNA can be maintained in cells separate from the chromosomes and genes can be introduced using these structures, so they do not integrate into the chromosomal DNA. However, with this approach, since the cell’s chromosomal DNA is altered, is usually not maintained in all cells after several replications. For permanent and inheritable genetic modification, such as those processes used for crop engineering, chromosomal modifications are used. How Is a New Gene Inserted? Genetic engineering simply refers to inserting a new DNA base sequence (usually corresponding to a whole gene) into the chromosomal DNA of the organism. This may seem conceptually straightforward, but technically, it gets a little more complicated. There are many technical details involved in getting the right DNA sequence with the right signals into the chromosome in the right context that enables the cells to recognize it is a gene and use it to make a new protein. First, you need a gene. This means you need the physical DNA molecule with the particular base sequences. Traditionally, these sequences were obtained directly from an organism using any of several laborious techniques. Nowadays, rather than extracting DNA from an organism, scientists typically just synthesize from the basic A, T, C, G chemicals. Once obtained, the sequence can be inserted into a piece of bacterial DNA that is like a small chromosome (a plasmid) and, since bacteria replicate rapidly, as much of the gene as needed can be made. Once you have the gene, you need to place it in a DNA strand surrounded with the right surrounding DNA sequence to enable the cell to recognize it and express it. Principally, this means you need a small DNA sequence called a promoter that signals the cell to express the gene. In addition to the main gene that is to be inserted, often a second gene is needed to provide a marker or selection. This second gene is essentially a tool used to identify the cells that contain the gene. Finally, it is necessary to have a method of delivering the new DNA (i.e., promoter, new gene, and selection marker) into the organism's cells. There are a number of ways to do this. For plants, my favorite is the gene gun approach that uses a modified 22 rifle to shoot DNA-coated tungsten or gold particles into cells. With animal cells, there are a number of transfection reagents that coat or complex the DNA and enable it to pass through the cell membranes. It is also common for the DNA to be spliced together with modified viral DNA that that can be used as a gene vector to carry the gene into the cells. The modified viral DNA can be encapsulated with normal viral proteins to make a pseudovirus which can infect cells and insert the DNA carrying the gene, but not replicate to make new virus. For many dicot plants, the gene can be placed in a modified variant of the T-DNA carrier of the Agrobacterium tumefaciens bacteria. There are a few other approaches as well. However, with most, only a small number of cells pick up the gene making selection of the engineered cells a critical part of this process. This is why a selection or marker gene is typically necessary. But, How Do You Make a Genetically Engineered Mouse or Tomato? A GMO is an organism with millions of cells and the technique above only really describes how to genetically engineer single cells. 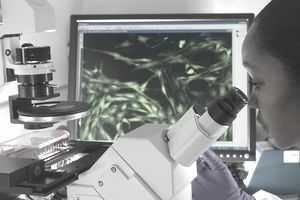 However, the process to generate a whole organism essentially involves using these genetic engineering techniques on germ cells (i.e., sperm and egg cells). Once the key gene is inserted, the rest of the process basically uses genetic breeding techniques to produce plants or animals that contain the new gene in all the cells in their body. Genetic engineering is really just done to cells.